Bonnard’s highly successful career as a painter and print- maker began modestly when he designed a poster for a Reims champagne manufacturer in 1889. Henri de Toulouse-Lautrec was so impressed with it that he decided to start designing posters of his own. Around this time Bonnard shared a studio at the foot of Montmartre with Édouard Vuillard and Maurice Denis. The artists had recently formed into a secret confraternity called the Nabis (from the Hebrew word meaning ‘prophets’), along with Paul Sérusier and others. Deeply influenced by Paul Gauguin, the young members of the group challenged the representational role of painting as an illusionistic window onto nature, as well as the traditional distinctions between fine and applied art. Their work is generally characterised by its flat, decorative quality and emphatic stylisation. United by their belief in the virtues of craftsmanship, and that art should be an integral part of daily life, the Nabis applied their skills to the creation of beautiful objects expressive of these goals, such as theatre sets, posters, costumes, tapestries, fans and decorative screens, as well as paintings. Bonnard’s aesthetic ambitions in the 1890s – a combination of what he had learned from Gauguin and from Japanese art – are manifest in his posters and lithographs, with their superbly decorative sense of design. Colour lithography in that decade had reached new heights, and Bonnard was able to take full advantage of the rapidly evolving technologies in colour printing, which enabled the mechanical mass-production of large-scale colour lithographic posters as never before. Using flat tints of silvery-grey and beige with patches of black and pink, Bonnard conceived one of the period’s most celebrated images in his advertising poster for the avant-garde literary journal La revue blanche (see 206.1978). It shows an elegant lady in front of a newsstand clutching a copy of the magazine, her demeanour a foil to that of the grimacing street urchin beside her. Bonnard’s witty take on poster design is carried further in his use of offbeat, hand-drawn lettering, where the letters ‘a’ and ‘v’ suggest the lady’s parasol. I’m making a screen for the Champ-de-Mars [the Salon des Indépendants]. In any case it will be for the present time the eighth wonder of the world. From my point of view I’m pleased with it and I also believe that it if goes to the Champ-de-Mars, it will be more noticed than its predecessors. There are people in the place of ducks and leaves. It’s the Place de la Concorde, where a young mother passes with her children, some nannies, some dogs, and at the top, making a border, a waiting station of carriages, all of which is placed on an off-white ground that looks indeed like the Place de la Concorde when there is dust and it resembles a mini-Sahara. 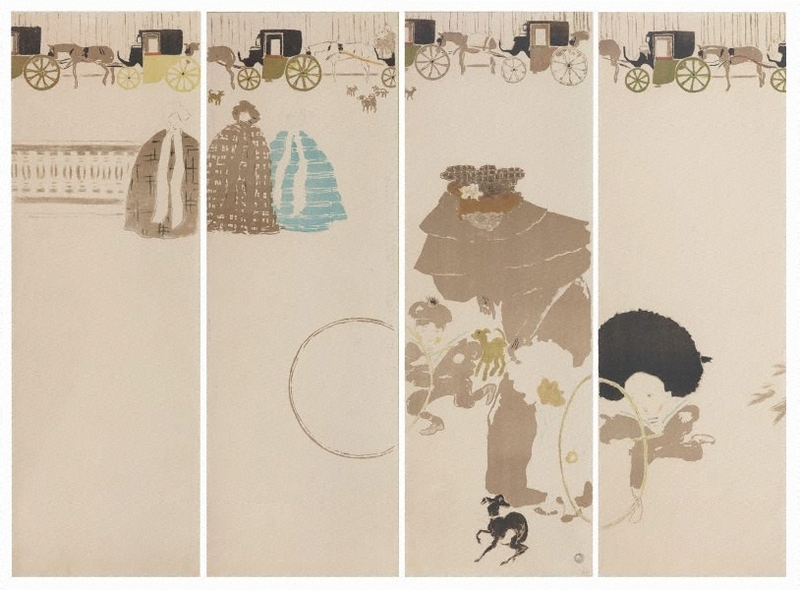 Bonnard later used the painted screen as the basis for an ambitious, five-colour lithograph, Nannies’ promenade, frieze of carriages. This audacious composition features expanses of blank paper, suggesting space not through unifying linear perspective on an extended surface, but through the use of fragments, which establish space around themselves. The lively foreground vignette shows a lady strolling with her bonneted daughter, while two boys with sticks and hoops dash past to the alarm of a little black dog. Three identical beribboned nannies have comically aligned themselves in front of the toy-like stationed carriages, the resemblance of which to the stencilled designs that adorned the cornices of children’s nurseries in this period has been perceptively noted by Gloria Groom. The lithograph is made up of four separate pieces of paper. It was sold either as individual sheets or mounted as a folding screen. Thus the lithograph could be applied to the domestic interior to create subdivisions within a room, or it could be framed and hung as a purely decorative item in the form of a polyptych. The Gallery’s example appears to have always served the latter purpose. Signed l.r.corner panel c, [inscribed on stone] "PB". Not dated. Bonnard , Paris, 1988, pp 44-45. Paths to abstraction 1867-1917 , Sydney, 2010, col illus p 128. Prints & drawings Europe 1500-1900 , Sydney, 2014, p 186, col illus p 187. Bonnard Lithographe , Monte-Carlo, 1952, p 91, p 92, col illus p 93. cat no 47 Note that the title used in this puiblication is the "Other title" in cataloguing details.